Jessie Magdaleno, who grew up in Las Vegas, is currently in contract talks to face Filipino Nonito Donaire in a junior featherweight title match that could land on the Manny Pacquiao-Jessie Vargas undercard on Nov. 5 at the Thomas & Mack Center. Jessie Vargas might not be the only Las Vegan named Jessie on the Nov. 5 boxing card at the Thomas & Mack Center. Jessie Magdaleno, who grew up in Las Vegas, is currently in contract talks to face Filipino Nonito Donaire in a junior featherweight title match that could land on the Manny Pacquiao-Vargas undercard. It would be a battle of the Filipinos versus the locals. Donaire (37-3, 24 knockouts) has never fought on the same card as Pacquiao. Magdaleno (23-0, 17 KOs) is the mandatory challenger for Donaire’s WBO 122-pound belt. Vargas will make his first WBO welterweight title defense against Pacquiao. 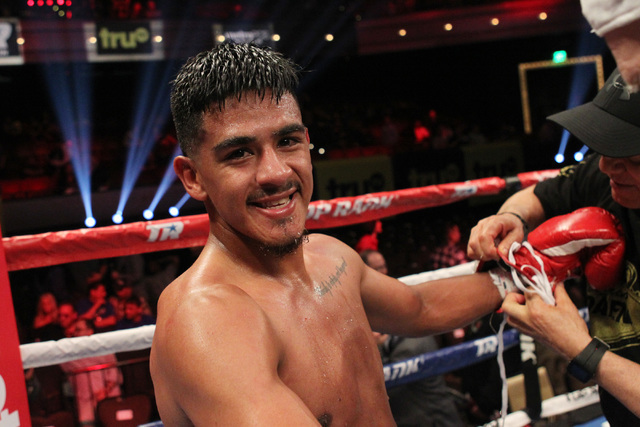 Receiving his first title shot on Nov. 5 would be an early birthday gift for Magdaleno, who turns 25 on Nov. 8. Jessie Magdaleno moved to Carson, California, two months ago to work out with new trainer Manny Robles. Magdaleno broke ties with former trainer Joel Diaz. Magdaleno said his relationship with Diaz wasn’t the same after Timothy Bradley Jr. left his camp last year. Top Rank promoter Bob Arum is expected to release the full Pacquiao-Vargas undercard on Sept. 8 during a news conference in Los Angeles.